Our iPhone apps offer students a useful way to self study on the go! Using a subset of our content database, students now have access to portable self study tools. 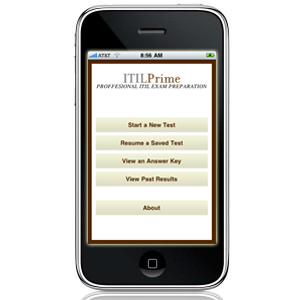 Our iPhone apps cover popular certifications which include the PMP® exam, ITIL® V3 Foundation exam, and the CISSP exam. Based on the PMBOK Guide - Fourth Edition (2009), our PMP exam prep app is designed to help students learn on the go with realistic PMP exam questions, progress-saving features, and easily accessible answer keys and explanations.